Choosing 16 & 32 Bar Cuts. My technique consists of a series of reflexive exercises (semi-occluded vocal tract), based on the vocology work of Ingo Titze, to connect the singer's voice (muscle) with their breath. Once these concepts become automatic the singer is able to produce sounds that can be classified as "belt", "mix", or "legit". These exercises also focus on the areas of articulation, pronunciation, breathing, posture, tone, blending registers, resonance / power, volume, endurance, range, and audiation. I do not teach a "cookie cutter" approach and custom tailor my sessions to match your learning style. I also specialize in breathing for the singer, actor, and or professional speaker. As a vocologist, I work with singers who are currently in, or in the past, have gone through many types of vocal rehab with a licensed ENT (ear, nose & throat) doctor or a speech therapist. I can incorporate your current rehab prescription into the session, supervised by your ENT or speech language pathologist. All sessions are audio recorded and sent to you using a free service called Dropbox. Once setup, you can access recordings of your sessions on your home or work computer, Ipad, Iphone or Android device. Many times sessions include work with a vocal acoustic monitor (VAM) so the client can hear themselves the way others hear them. I also use a computer spectrogram to allow clients to see their voice as real time picture as well as a computer pitch counter for clients with pitch matching problems. Singers and dancers auditioning for Broadway shows, community theater shows, cruise line auditions, and college music/theater program auditions. Actors who've never sung before. Dancers who've never sung before. Recording artists going into the studio to record or going on tour. Children who are looking to maximize their voice appropriately for their age. People who just love to sing for fun, between the ages of 2 and yes, 88. 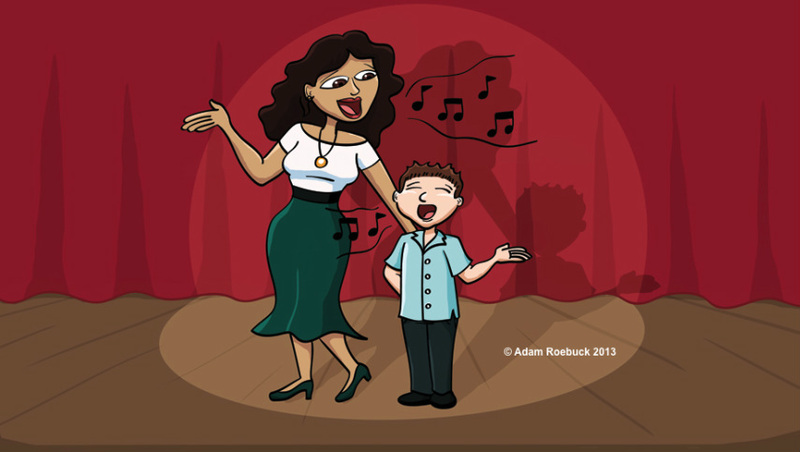 Each class will comprise of a vocal warmup and individual time in front of the class. This class is great for beginners, singers who haven't sung in years, or dancers and actors with little singing training, and those with fear of singing in front of others. The class costs $200 total. Adam's students have appeared on Broadway, MTV, TV, & Film. NYC private lesson clients must cancel or reschedule with at least 48 hours notice to not be charged for their schedule lesson. NJ private lesson clients as well as Skype clients must cancel or reschedule by 9AM on the day of the lesson to not be charged for their scheduled lesson. There are no exceptions.